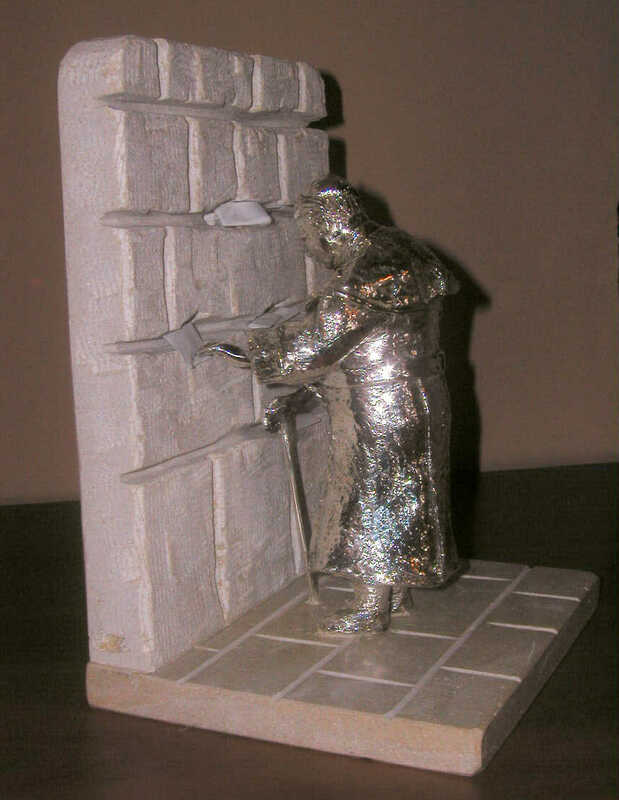 On May 27th, 2006, Gary Krupp, President of Pave the Way Foundation along with the Board and advisors and special guests and contributors, presented a special sculpture representing a monument to be placed in Poland, the homeland of Pope John Paul II. This event was held at a papal dedication ceremony in Wadowice. Poland, the birth place of Pope John Paul II. This project has been planned with Jerzy and Irene Kluger, lifetime friend of Pope John Paul II, and H.Em. Stanislaw Cardinal Dziwisz, secretary to the Pope for over forty years. 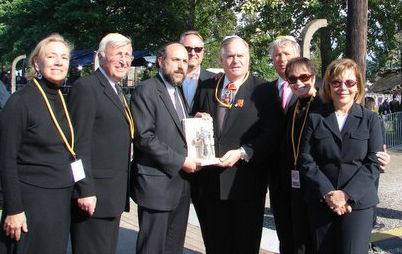 PTWF delegation in Auschwitz May 28, 2006 presenting statue of the Polish monument of Pope John Paul II to the Chief Rabbi of Poland Rabbi Schudrich. Pictured from PTWF with Rabbi Schudrich (l to r) Rabbi and Mrs. Benjamin Blech, Rabbi Schudrich, Sculpture Sam Philipe, Gary Krupp, Elliot Hershberg, Meredith Krupp, and Karen Hershberg. This monument will be in commemoration of Pope John Paul II for his lifetime commitment to religious reconciliation. Right, is the miniature sculpted by Israeli artist Sam Philipe of Jerusalem. This miniature has been presented to those who have paved the way to the most important event and will be presented to each individual who helps us to complete the monument. 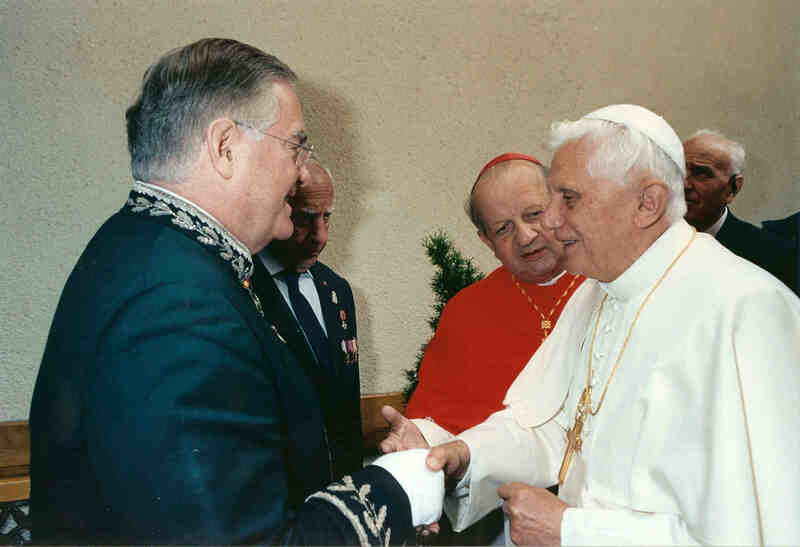 Gary Krupp and Jerzy Kluger, both of Pave the Way, welcome Pope Benedict XVI and Stanislaw Cardinal Dziwisz into the childhood home of Pope John Paul II in Wadowice Poland during the Papal mission to Poland May 27, 2006. 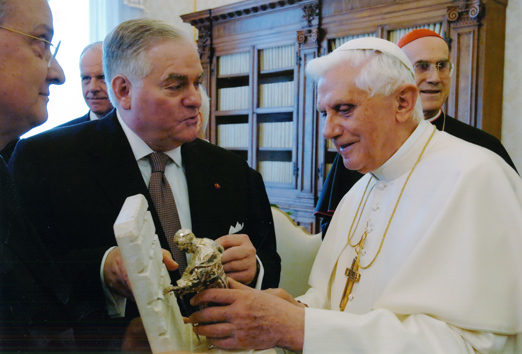 His Holiness, Pope Benedict XVI, is given the gift, of the miniature of the monument, to be erected in Krakow, Poland. The Polish government is excited about this wonderful gesture where Jerusalem stone will be brought to Krakow to simulate the Kotel or the Western Wall. Gary Krupp and Sam Philpe discussing the many changes that need to be made to the monument, currently under construction in Netanya, Israel. 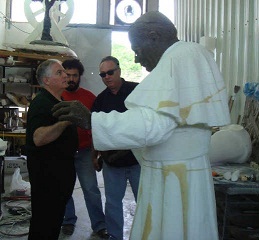 To begin, the head has been fabricated in clay and the body in Styrofoam, which will be shaped to exactly duplicate the cassock thatPope John Paul II wore that day of one of the most important inter-religious gestures in history. 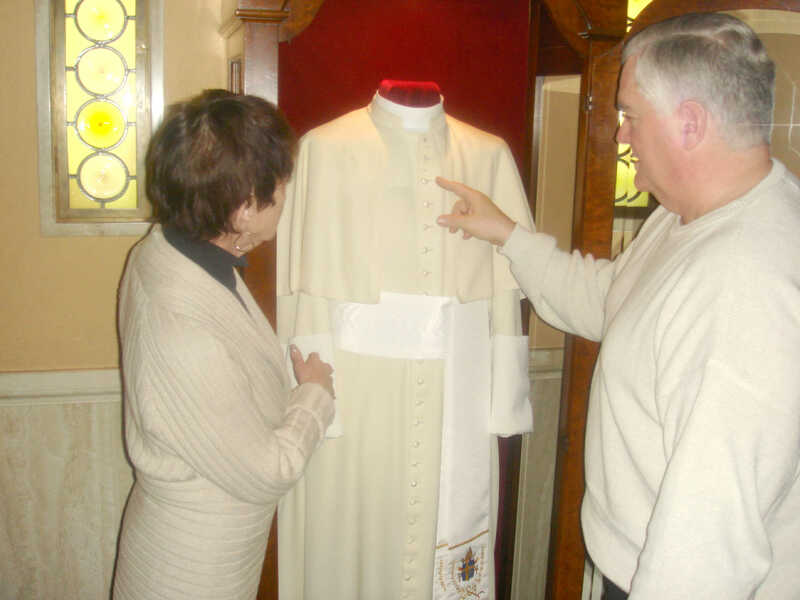 Below, through the courtesy of Opus Dei Gary and Meredith Krupp obtained special permission in Rome, to examine and photograph the actual Papal cassock given to Opus Dei personally by Pope John Paul II. These studies are being used to assure the accuracy of the monument under construction in Israel.